From left, Laura Gray, Don Bennett and Sarah Gould at Tri Cycle Farms. FAYETTEVILLE, Ark. – Laura Gray and Sarah Gould, both pursuing their bachelor's degrees in biological engineering at the University of Arkansas, did not anticipate that their participation in the 2017 Social Innovation Challenge would turn into a year-long thesis project. But that's exactly what has happened; the two juniors are working with Tri Cycle Farms to implement their proposal, developed in the fall semester during the annual competition, for a hydroponics system to improve Tri Cycle Farms' ability to address food insecurity in Northwest Arkansas. Led by Rogelio Garcia-Contreras, director of social innovation, the initiative is part of the Office of Entrepreneurship and Innovation. Its purpose is to allow students, faculty and staff to connect with local organizations that are tackling social and environmental issues within the community. Once a year, the Social Innovation Initiative hosts a Social Innovation Challenge, in which students partnering with an organization can partake in a competition to present entrepreneurial, market-based, viable, and sustainable solutions to problems posed by the organization. Jennie Popp is the associate dean of the Honors College and co-chair of the Service Leaning Initiative. She has helped to organize and formalize service learning through the Initiative at the University of Arkansas. "Service learning gives the students real world experience to test the knowledge they learn in the classroom. It can also lead to internships and job offers from the organizations with whom the students work," said Popp. Popp has also served as a judge for the Social Innovation Challenge for the past two years. She describes the challenge as being extremely beneficial to students who are looking to make a change in the community, while having the opportunity to discover an important, worthwhile thesis topic. When asked why the challenge piqued her interest, Gould answered, "I like to get involved and stay busy. Laura and I were really excited about all the projects listed in the informational email, so we set up a meeting with Rogelio to learn more about the challenge." Gould and Gray described that activism, nonprofit involvement, and the idea of having the opportunity to learn not only about how to physically structure the project, but also how to look at it from an economic perspective, were all reasons why they wanted to join the challenge. Gould and Gray partnered with the non-profit Tri Cycle Farms, located on Garland Avenue in Fayetteville. Tri Cycle Farms is a community farm working to address food insecurity by growing food and teaching others how to grow food. "One in four children in the state of Arkansas are food insecure," said Don Bennett, founder of Tri Cycle Farms. Bennett said that once he learned this, he began doing research into the food system in Washington County. "I found a purpose," he said. Tri Cycle Farms redistributes about 50 tons of food per week and works to teach garden and farming education to people within the community. Gould and Gray chose to partner with Tri Cycle Farms because they believed that with their engineering background, they could implement a hydroponics system within a greenhouse, also known as a hydro-house, to improve crop yields and reduce water usage. 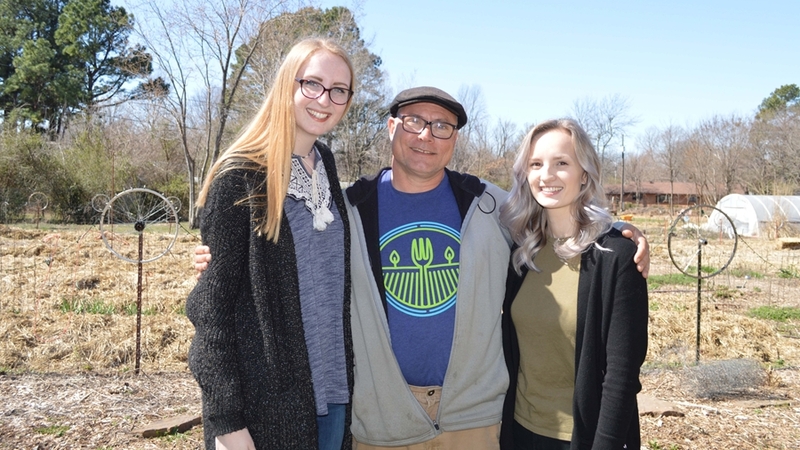 "Tri Cycle Farms does a lot of community activism and wants to use the hydro-house as not only an effective way to grow plants, but also as an educational opportunity for students," said Gray. Once the hydroponics greenhouse is finished, Bennett would like to call it the "Seed-to-Sell Learning Project." He wants the house to provide opportunities for student groups and interns to obtain service learning hours from working in the hydroponics house and helping it develop. Gray and Gould both emphasized the value of the Social Innovation Challenge in getting their project launched. "We knew, regardless of the challenge outcome, we wanted to continue our work with Tri Cycle Farms," said Gould. "While we did discover this project as our thesis, the reward of finishing it is so much more than us, or our thesis. It has such a lasting impact on the community." When asked how the challenge helped them in their professional experience and with their personal growth, Gray answered, "Being engineering students, we are not exposed to very much business. It forced us to think more about the economic side of things. We went from having zero experience to having the opportunity to apply so many concepts we learned to the real world." Gould and Gray continue to work on the hydroponics greenhouse system for Tri Cycle Farms, which will be used as a service learning project for future students when it is complete. The two students are also able to continue working towards their thesis project while helping the community. "Although Laura and Sarah did not win the Social Innovation Challenge, they have demonstrated success by making a commitment and a connection to our organization," said Bennett. "In the end, Tri Cycle Farms won. Laura and Sarah have committed over a year and a half to this project." About the Office of Entrepreneurship and Innovation: The mission of the University of Arkansas' Office of Entrepreneurship and Innovation is to catalyze entrepreneurial activities and innovation across the university and throughout the state in order to build Arkansas' knowledge-based economy and support healthy, sustainable communities.